Neptun, Uranus and Pluto are dealt with on one page since they were discovered relatively late and thus played no role in traditional astrology - and they have no ancient history to explore. Planets - along with Sun and Moon - are the only objects in the sky that are a) visibly moving (hence the name 'planet' which translates as 'wanderer') and b) can be seen with the naked eye. From ancient times on humans have seen significance in the planets' movements, have viewed them as gods or at least as belonging to gods, showing their gods' moods and will. 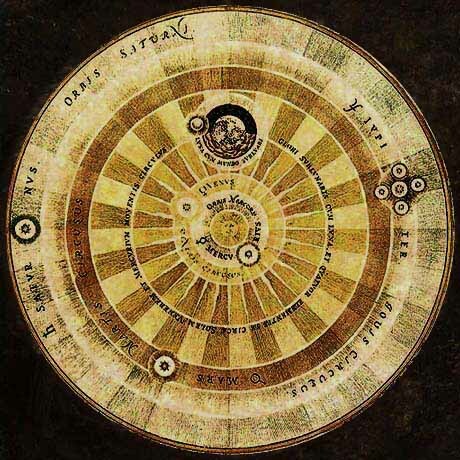 Even today astrologers define a planet's meaning via its given name which in turn means nothing else than that modern astrology still rests on the bases from milleniums ago. A lot of the planets' characterization stems from their appearance in the sky. Venus is a bright planet, the brightest object in the sky next to Sun and Moon, which eyplains that Venus was always connected with both love and war. Mercury moves fast and is not always visible, hence its connection with swiftness and activity. Jupiter can at times be almost as bright as Venus and Mars is brightest when in opposition to Earth, both were associated with power - the slow moving Jupiter with regal power and Mars, due to its reddish colour (association to blood and fire) with war. Saturn is dim and extremely slow, which was seen as firm and reliable and earned the planet the title 'Sun of the night' in Mesopotamian cultures. The Mesopotamian gods are sometimes complicated to define when their many names and attributes often changed or were shifted between them. So for example the planet Saturn is usually connected to the Sumerian god Ninurta, who is identified with Nabû, and Nabû is connected to the planet Mercury. This stems partially from the very different cultures of Mesopotamia, the Sumerians, Akkadians, Babylonians, Assyrians, all of which had vast pantheons, but also from the change of the societies and the subjects of importance. Early nomadic cultures all saw the Moon as the main and most essential planet and god, later agricultural people tended to favor the Sun as more important. A god of scripture was of little significance when writing was rare or almost unknown even among priests, later on the god(s) of scripture rose to powerful deities with all kinds of associations. Yet there had been always but those seven planets and of course they had to be assigned to major gods when they were almost seen as the gods themself. Rather unaffected by this confusion are the Sun as Utu aka Shamash, the Moon as Sin or Nanna and also Venus as the godess Ishtar. They were part of the 'Great Seven' which were relatively unchanged and universal. Jupiter, Mercury, Saturn and Mars however could get rather entangled with each other. I have made my life easy referring to 'Mesopotamia' all the time in the description of the planets. 'The ancient Mesopotamian this or that' is however a wide definition, and to not get utterly confused in later studies I supply here a little list about the most important Mesopotamian eras. Mesopotamian history spans over thousands of years, the first known permanent settlements being those of the Sumerians in the 4th millenium BC. Since then periods have been changing from one culture to the next, all closely related and one builduing upon the other. The pantheons of these cultures varied and changed, yet a great part just changed a name or experienced a shift in importance. The Sumerian Utu and the Akkadian Shamash are one and the same god.